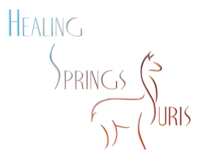 She represents 20 years of Pucara International selecting, culling and breeding to produce suri alpacas that make the great suris so special. When we acquired Chachapoya to combine with our Pucara genetics we thought we were onto something special. 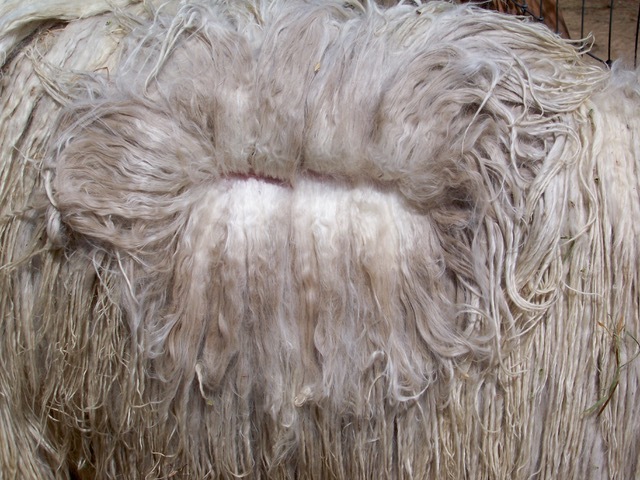 Chachapoya had a number of cria that had blazing luster and elite lock formation. We did not hesitate to jump at a purchase. So it turns out when Kahuna and the Chachapoya lines are combined we get an out cross that accentuates the traits for luster, fineness and lock. Those genetics are what is behind the dam, Kalea. 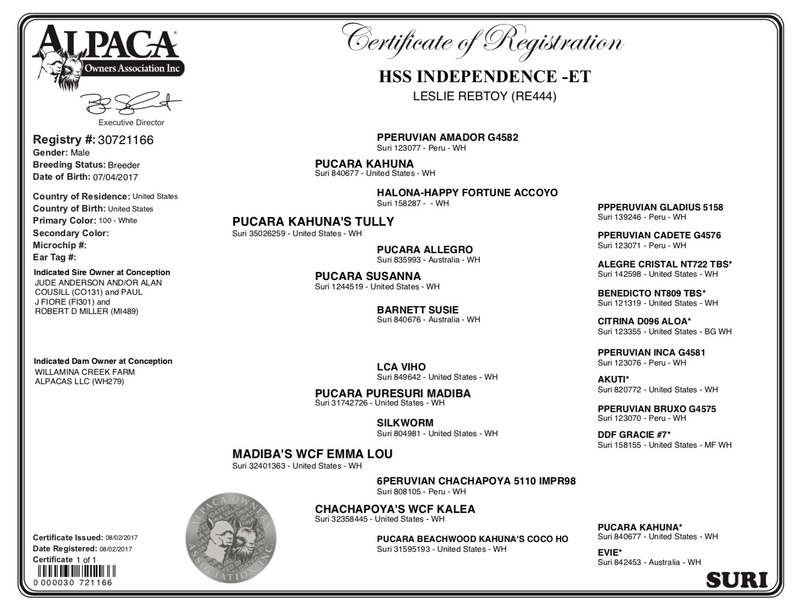 The sire of Emma Lou is Pucara PureSuri Madiba. 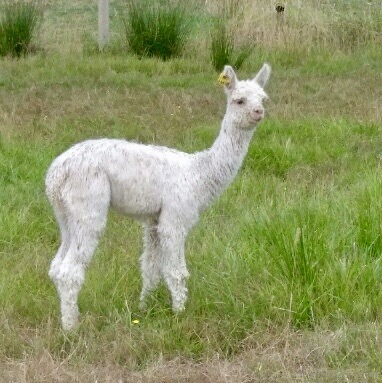 His cria are a testament to the faith we have placed in his prepotence. Not just saying it. We already have several Get teams from his kids that will push the competition at the best shows! Madiba's genetic input is via the famous Silkworm and LCA Viho one of the most dense males we have ever put our hands on! Emma Lou is a bold representation of those traits. She is an alert upright girl with presence and a suri profile that would please the most discerning buyer. Naturally being a Kahuna descendant she has a beautiful head with a frame blessed with ample girth and well sprung chest and hip capacity. A quiet suri but its when you open her fleece that you know!!! 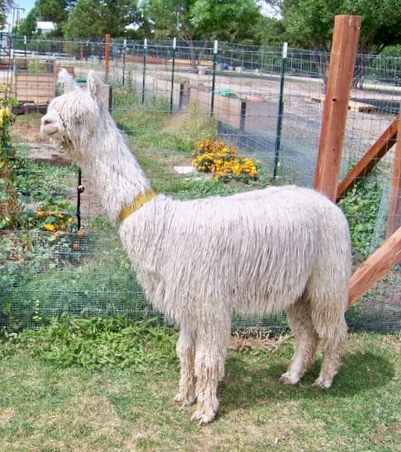 Emma Lou's fleece exhibits abundant luster in a thick dense covering from chest to tail and down to the ground. 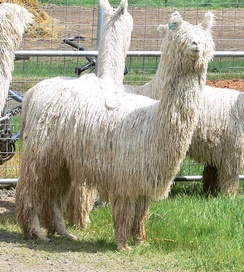 It has that Chachapoya style lock formation, who is her maternal grandsire, that parts easily to express the luster from a fine and dense fleece. However its whats next that matters. 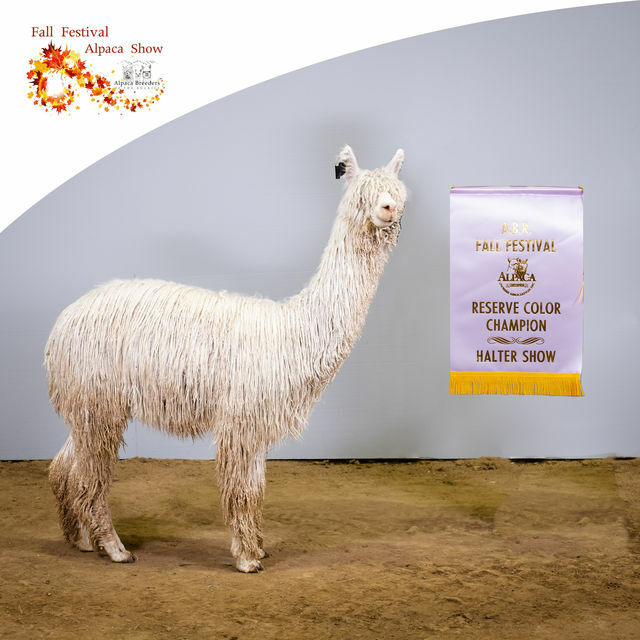 It is the breeding in the future that could very well produce for you one of the very best suri cria in the US. She could very well make your stud male famous. It has taken us 20 years to produce alpacas like Emma Lou and lucky you can save yourself that amount of time by making a discerning purchase right here. We have already harvested embryos from Emma Lou and look forward to seeing more! This beautiful future herdsire is the result of hard work by Jude Anderson, Al Cousil and Natasha James of Alpaca Embryo Technologies, LLC. Independence is the first embryo transfer cria born in North America, and we couldn't be more pleased with the outcome of this cross. With genetics like these, this male is destined for greatness. Look for Indie in the show ring in 2019. He's going to turn heads!